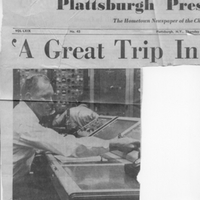 A newspaper article published by The Plattsburgh Press-Republican on October 4, 1962. Dr. Calvin D. Fowler was the manager of Cape Canaveral Air Force Station Launch Complex 14 during the final three launches of Project Mercury. In this newspaper photograph, he is shown sitting at the Launch Conductor's console in the blockhouse at Launch Complex 14 (LC-14), launching Wally Schirra (1923-2007)'s Mercury-Atlas rocket, named Sigma 7, into space. Dr. Fowler would go on to do the same for Gordon Cooper (1927-2004). Original newspaper article: "A Great Trip in a Sweet Bird." The Plattsburgh Press-Republican, Vol. LXIX, no. 45, October 4, 1962: Private Collection of Dr. Calvin D. Fowler. Digital reproduction of original newspaper article: "A Great Trip in a Sweet Bird." The Plattsburgh Press-Republican, Vol. LXIX, No. 45, October 4, 1962. Originally published by The Plattsburgh Press-Republican. Copyright to this resource is held by The Press Republican and is provided here by RICHES of Central Florida for educational purposes only. “A Great Trip in a Sweet Bird.” RICHES of Central Florida accessed April 21, 2019, https://richesmi.cah.ucf.edu/omeka/items/show/4968.